The fix was in for this rhesus macaque drinking juice on the Ganges River in Rishikesh, Uttarakhand, India. No gambling was required to get the reward. "They did not like the gambles anymore," says Veit Stuphorn, an author of the study and an associate professor at Johns Hopkins University. The finding in our fellow primates adds to the evidence that human brains are capable of constantly adjusting our willingness to take risks, depending on factors such as what's at stake. "For a long time, people thought that this is like a personality trait, that some people are risk-takers and others are not," Stuphorn says. But recent research has shown that the same person who is very cautious about personal investments may be an avid bungee jumper. This study involved two monkeys that learned to play a computer game that gave them drops of juice when they won. The monkeys played voluntarily because they liked to gamble, Stuphorn says. The game offered two options. The first was a juice reward that was guaranteed, but usually small. The second was a gamble: It might bring a lot of juice, or none. The monkeys moved their eyes to indicate their choice in each round. "They're always tempted to go for it," Stuphorn says. "They're going for the big win every single time," even when safe bets would have won them more juice overall. Stuphorn's team suspected that this preference for long shots was linked to activity in a small area of brain in the prefrontal cortex that's involved in eye movements. When a monkey won big, brain cells in this area got really active. But that jump alone didn't prove that these cells were affecting the monkey's behavior. So the researchers did another experiment that temporarily inactivated the brain area by cooling it. The finding shows at least one way the brain can change an individual's willingness to take risks, says Alireza Soltani, who studies decision-making at Dartmouth College and wasn't involved in the study. And the change probably depends on a lot of factors, he says, including what's at stake. 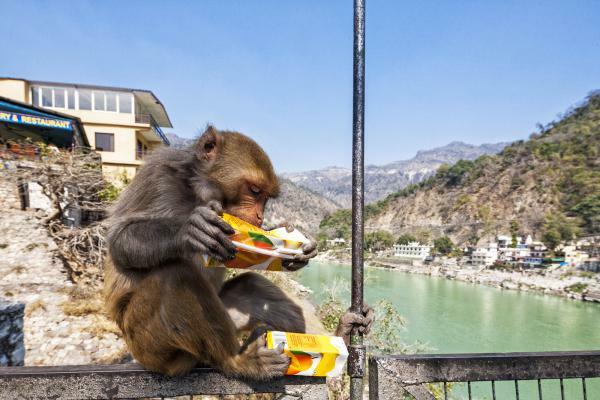 "The monkeys are playing for a drop of juice and that's not a big deal," Soltani says. So they take big risks just to keep the game interesting. Other studies have found that both monkeys and people are more likely to hedge their bets when the stakes are higher. And scientists think the brain circuitry is probably similar. The idea that the brain is constantly adjusting our view of risk has big implications for society, Soltani says. "If you look at risk preference as not something that is fixed and set in stone," he says, "then we can actually think about what we can do to help people to change their risk preference to something that is better for them." The brain area identified in the monkey study is involved in eye movement. But it's unclear whether this same area affects risk preferences that involve other types of movement, says Michael Platt, James S. Riepe University Professor of neuroscience, marketing and psychology of the University of Pennsylvania. He suspects that different brain areas with a similar function may influence other risky behaviors, "whether that's reaching out to pull the handle on a slot machine or walking to the casino in the first place." Understanding the circuits that influence risk-taking could have some important practical applications, Platt says. "One would be to help people who have decision-making disorders, whether that's problem gambling or addiction, or other things like that," he says. "So we might be able to develop more effective therapies." Understanding why our brains sometimes tell us to do something risky also could help all of us make better decisions, Platt says. Scientists have identified a small area of the brain that seems to play a big role in how we think about risk. NPR's Jon Hamilton reports on what scientists have learned about risky behavior from two gambling monkeys. JON HAMILTON, BYLINE: These rhesus monkeys play for juice. And Veit Stuphorn, a brain scientist at Johns Hopkins University, says they're really into it. VEIT STUPHORN: (Laughter) Yeah, they do like to gamble, actually. HAMILTON: So Stuphorn's lab had the monkeys play a gambling game while monitoring the activity in their brains. The game had two options. Option one offered a juice reward that was guaranteed but usually small. Option two was a gamble. Stuphorn says it might bring a lot of juice or none. STUPHORN: And the monkey had to choose every single time whether he wanted to have the gamble or the sure thing. HAMILTON: Stuphorn says the experiment confirms something other scientists have noted about gambling monkeys. STUPHORN: They're always tempted to go for it. They're going for the big win. HAMILTON: Even when safe bets would have won them more juice. Stuphorn's team suspected that this preference for long shots was linked to a small patch of brain in the prefrontal cortex. When a monkey won big, brain cells in this area got really active. But that didn't prove these cells were affecting the monkeys' behavior. So the researchers did another experiment that temporarily inactivated this brain area by cooling it. Then they let the monkeys continue playing the juice game. And Stuphorn says the animals' behavior changed. STUPHORN: They did not like the gambles anymore so much - that had the large variability. Instead, they went for gambles with - it was a smaller range of outcomes. HAMILTON: In other words, they took safer bets. Stuphorn says the finding adds to a body of research that is challenging an old idea about risky behavior. STUPHORN: For a long time, people thought that this is something like a personality trait, that some people are risk takers and other people are not so risk-seeking. HAMILTON: But this study suggests that an individual's risk preference can be changed simply by increasing or decreasing the activity in one area of the brain. Stuphorn says that probably means our brains are constantly adjusting our desire to take risks, depending on the situation. That view is shared by Alireza Soltani who studies decision-making at Dartmouth College. Soltani says gambling monkeys probably take big risks because the stakes are so low. ALIREZA SOLTANI: The monkeys are playing for a drop of juice, and that's not a big deal. HAMILTON: Soltani says other studies have found that when the stakes are higher, both monkeys and people are more likely to hedge their bets. And he says this emerging idea that the brain is constantly adjusting our view of risk has big implications for society. SOLTANI: If you look at risk preference as not something that are fixed and set in stone, then we can actually think about what we can do to help people to change their risk preference towards something that is better for them. HAMILTON: Like not texting while you drive. The monkey study focused on a brain circuit that's involved in eye movement. That's because the game had the animals move their eyes to make choices. But Michael Platt of the University of Pennsylvania says there may be many other risk circuits in the brain that influence other risky movements. MICHAEL PLATT: Whether that's reaching out to pull the handle on a slot machine or walking to the casino in the first place. HAMILTON: And Platt says understanding these circuits could have some practical applications. PLATT: One would be to help people who have decision-making disorders, whether that's problem-gambling or addiction or other things like that. So we might be able to develop more effective therapies. HAMILTON: Also, Platt says, if we understand why our brains sometimes encourage risky behavior, it could help all of us make better decisions. Jon Hamilton, NPR News. (SOUNDBITE OF BUD POWELL'S "COLLARD GREENS AND BLACK EYED PEAS") Transcript provided by NPR, Copyright NPR.